French rabbi; said to be a descendant of Löwe ben Bezaleel; born 1760 at Mutzig; died May, 1842, at Rixheim. On finishing his studies at the famous yeshibah of Prague he was appointed principal of a Talmudic school at Strasburg, where he remained for twenty years. He lived for some time subsequently at Mutzig, filling the office of syndic. When the rabbi of that community, the pious Simon Cohen, later chief rabbi of Colmar, was arrested by order of Schneider, the notorious indicter of the Revolutionary tribunal of Strasburg, Munius, is said to have appealed to the latter in behalf of the rabbi, regardless of the danger he was thereby incurring. Schneider promised to release Cohen, but could not carry out his promise, as he himself was arrested and taken to Paris (1794), where he was condemned to death. Munius soon after accepted the rabbinate of Rixheim, where he died. 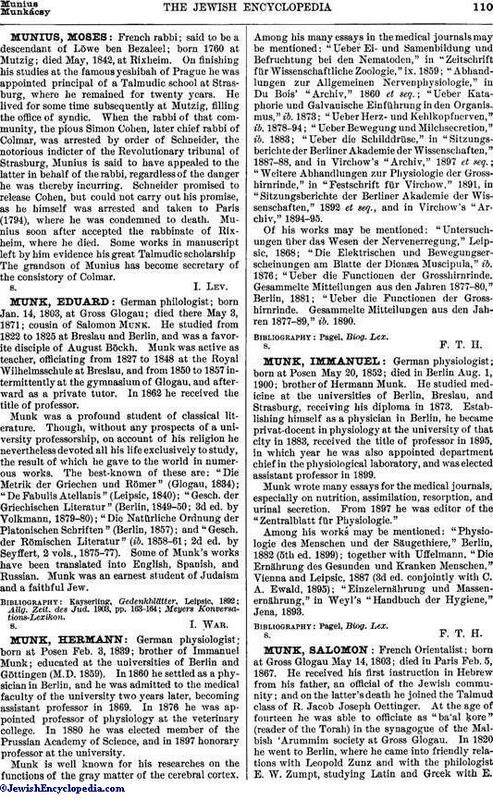 Some works in manuscript left by him evidence his great Talmudic scholarship The grandson of Munius has become secretary of the consistory of Colmar.